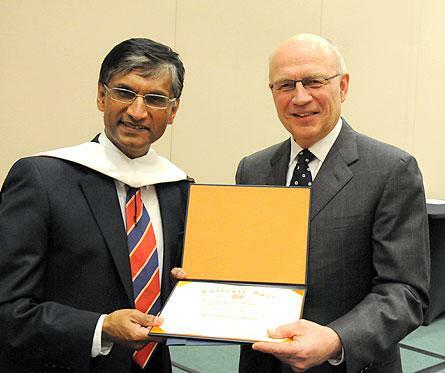 Hope College has presented an honorary degree to Dr. Gerald Pillay of Liverpool Hope University for his effective service and leadership in education and building understanding. Dr. Pillay, who is vice chancellor and rector of Liverpool Hope University, one of Hope’s international partner institutions, received the Doctor of Letters from Hope on Thursday, April 11. He was honored for his service and leadership at Liverpool Hope University and in education as a professor, scholar and administrator committed to producing a better tomorrow; his promotion of global understanding through collaborative initiatives, including the partnership between the university and Hope College; his vision in establishing the university as a center for religious reconciliation; and his inclusion of Christian principles in his personal and professional life. Read text of honorary degree presentation by Alfredo Gonzales, associate provost and dean for international education at Hope College. Dr. Pillay was born in the former British colony of Natal in South Africa. He was awarded a B.A., a B.D. (with distinction) and Doctor of Theology from the University of Durban. He also achieved a D.Phil. in Philosophical Theology from Rhodes University. After lecturing at the University of Durban-Westville, he became professor of ecclesiastical history at the University of South Africa in 1988, a post he held for eight years. During this period he was also variously a guest professor at Northwestern University in Illinois; a research fellow at Princeton University; a visiting professor at Eastern Mennonite University in Virginia; a guest professor at Rhodes University and a visiting professor at the graduate school at AMBS, Indiana. In 1997 he became Foundation Professor and head of the Department of Theology and Religious Studies at Otago University, New Zealand’s oldest university, based in Dunedin in the South Island. He was asked to serve as the first head of liberal arts within that university in 1998. He has served in various senior leadership roles at the University of South Africa, the Human Sciences Research Council in Pretoria and the University of Otago. Dr. Pillay has been with Liverpool Hope University since 2003. He was initially appointed head of Liverpool Hope University College, an institution whose first founding college was established in 1844. He became the first vice chancellor when Liverpool Hope was given full university status in July 2005. He has served on editorial boards of two international journals, “Studia Historiae Ecclesiasticae” and “Verbum et Ecclesia”; has presented papers at numerous international conferences; and has served on various public and educational bodies. He has published extensively and is an internationally respected scholar. He was elected a Life Fellow of the Royal Society for the encouragement of Arts, Manufactures & Commerce (RSA) in October 2005. Among other activities in the Liverpool community, he is currently a governor of Liverpool Community College, a member of the Board of the Liverpool Biennial, an honorary vice president of Personal Services Society and a Cathedral lecturer at the Anglican Cathedral. Liverpool Hope University, which enrolls more than 7,000 students from more than 60 countries worldwide, is the only ecumenical university in Europe combining Anglican and Catholic traditions. Hope’s first exchange with the university took place in the fall of 1997, when two students from the university spent the semester at Hope to complete their student teaching. Hope students started studying in Liverpool during the spring of 1998. The relationship began in 1996, when representatives of the university visited Hope while in the process of renaming their institution. They liked the college’s name and felt that it suited well their own institution’s mission. A new academic exchange agreement was signed when former Provost James N. Boelkins and Gonzales visited Liverpool Hope University in June 2006. Both Dr. Pillay and his wife, Dr. Nirmala Pillay, delivered public lectures while on campus. Dr. Nirmala Pillay, who is a professor of law at Liverpool John Moores University, presented “The Practice of Torture in Democracies” on Wednesday, April 10. She has taught philosophy and law at universities in South Africa, New Zealand and England, and her research interests include public law, European Union law, human rights and the globalization of crime. Dr. Gerald Pillay presented “The Public Responsibility of a Christian University: The Apartheid Era as a Case Study, and Special Responsibilities in an Age of Secularism” on Thursday, April 11.